One of the hoariest suggestions from Catholic liberals has been the idea of part-time priests, ordained for a specific community, the one in which they live. Or rather, the other way round: seeing a community lacks a priest, the bishop just ordains some suitable member of it. Frequently this is coupled with the idea that the community proposes or nominates this individual, who of course may be married. Sometimes the enthusiasm for the idea that communities have a right to a priest suggests to the more far-gone progressive that ordination is not, after all, necessary. Here's a typical bit of advocacy for the idea, provided by our old friend Mgr Basil Loftus, in his Catholic Times column of 13th October. Surely a priest growing out of a congregation has many advantages over one parachuted in from outside. A home-grown 'Massing-priest' would be in no doubt as to his place in the communicability - one with all the baptised, serving them in a particular way. ... He would have earned their place in their esteem. He would not bring in extraneous priestly conventions or styles of living. The Bishop stands before his throne. In dealing with this kind of thing it is natural to distinguish the theological core of the proposal and the surrounding issues, both intended and non-intended consequences. 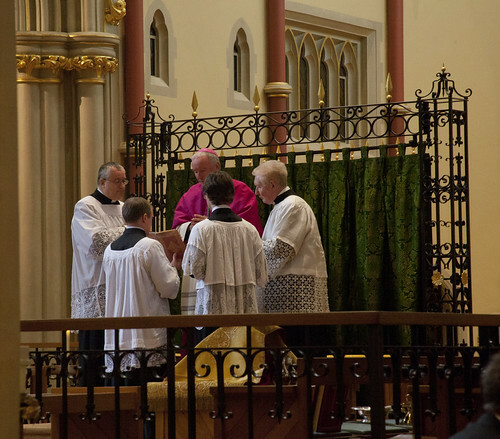 In terms of sacramental validity it is of course possible for a bishop to ordain a man who has undertaken only the kind of part-time training a permanent deacon might have, or a bit more, and he might have a dispensation to be ordained while married. (In passing it is worth noting that in it would appear that the part-time priest is envisaged as having less connection with the diocese, less training, and less commitment, than permanent deacons do now.) And he might be ordained on the understanding that he not be at the bishop's beck and call, and just celebrate Mass where he happens to live. But to assess the proposal is not just a matter of asking whether various dispensations or unusual circumstances would impinge on sacramental validity. We have to ask what understanding of the priesthood is at work here. One way in here is to ask whether this 'Massing priest' is going to exercise spiritual paternity over his community, to hear confessions, to administer the Sacrament of the Sick, to prepare people for the sacraments, to receive converts. These are all essential elements of the pastoral priestly role, he's not just saying Mass in a chantry chapel like the Massing-priest of the Middle Ages, nor is he doing some academic or administrative job like many priests in the 1950s. These are awkward questions, because if the answer is 'no' then the community is not really being served, but if the answer is 'yes' the idea that all that needs to happen is the bare fact of ordination after some kind of Open University course breaks down. Even a small community will generate pastoral and spiritual challenges for which proper training is essential, and will generate a volume of work vastly in excess of Sunday mornings. Indeed, small, isolated communities can be particularly hard work, as whatever priests are available have to share out the even more isolated populations in between the villages, on small islands, in places with no roads, and so on. The more easily available a priest is, in these situations, the more work for him will present itself. And help from other priests and the diocese centrally is a long way away. Like Mgr Loftus, I have experience of these kinds of places. A missionary priest out on his own needs more, not less, training than a priest in a city parish. 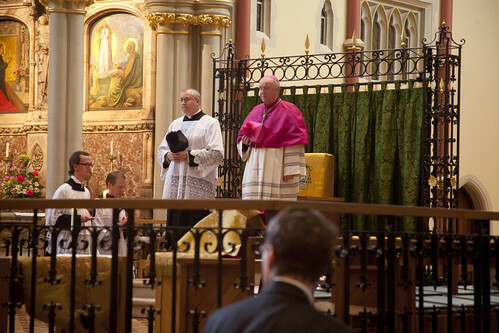 The Bishop reads one of the liturgical texts, while it is proclaimed by the celebrant. That is a hint of the problem, but the problem is deeper. It is about the nature of the priesthood, and the priest's relationship with his bishop and his community. The priest is conformed to Christ in a special way: this is reflected, in West by celibacy. He is part of the bishop's family in a special way: he takes a vow of obedience to him. He is committed to his community in a special way: he will be required to give an account for all of their souls on the Day of Judgement. A priest is not just a handy person who can say Mass, as the village plumber or postman is handy. He is the shepherd who gives his life for his flock: or should do so. 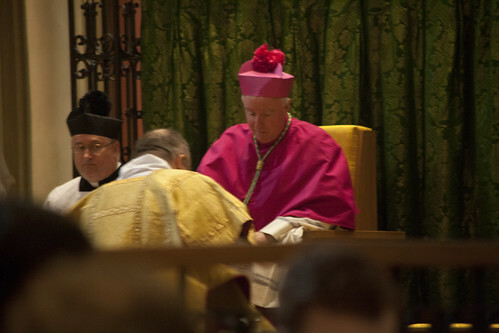 The Bishop blesses the Deacon, who is about to proclaim the Gospel. It may seem that if there is no resident priest and some retired priest like Mgr Loftus (heaven help us) has to drive vast distances to say Masses, the community has no pastor in the sense I am talking about, so there is no reason not to replace one unsatisfactory situation with a less unsatisfactory one, a resident part-timer with a limited brief. But there is a reason: the first is an unsatisfactory situation, the second is an attack on the theology of the priesthood. If you undermine the priesthood, in the Faithful's understanding, you will of course eliminate any chance of the vocations which can really solve these pastoral problems. To an extent, of course, this has already happened. I don't think that this idea is going anywhere; it has been kicking around for long enough and has never been taken seriously in Rome. Ideas like this, however, are going to get the dust blown off them under the present Pontificate, even if only by liberal newspaper columnists like Loftus, so it is as well to remind ourselves why they are not going to work. The Bishop gives the final blessing. 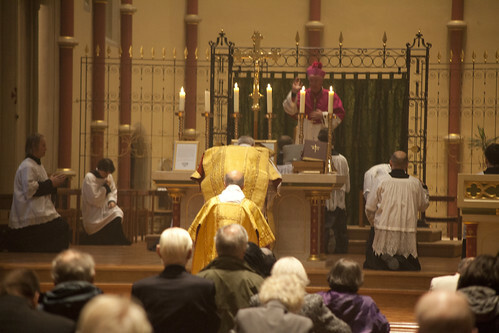 Pictures: Bishop Egan presides at Mass in the Extraordinary Form in his Cathedral, Portsmouth, last weekend. More here. When an Anglican, I had experience of this sort of experiment in the Scottish Episcopal Church where 'Non-Stipendary Ministers' became quite common in an attempt to prop up tiny congregations in a cheap way. It tends to encourage the view that theology is pretty much reducible to how you feel (because that's really all you've got to go on in the absence of proper theological formation). If it's coupled with clerical status going to the head (a not uncommon result) you get Henry VIII liberalism: anything goes so long as it's what I think. I'm not surprised Msgr Loftus is in favour. Part time parenting? Shall I only parent my children a few hours a week? This is indicative of an age which has lost the idea of VOCATION. But isn't what Mgr Loftus asks for in the passage cited a characteristic of the diocesan priesthood? 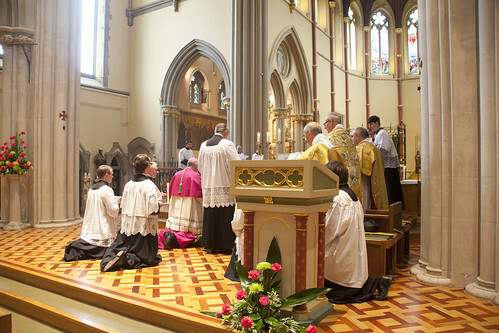 Ideally, a man will present himself to the bishop of the diocese where he has grown up so that he can serve the faithful of the same diocese as their priest. He wouldn't be 'parachuted in from outside'; he would be serving his own people. 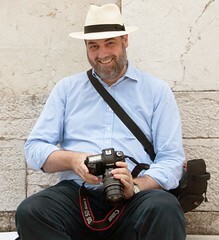 Yes, indeed priest do grow up out of the communities: where else? Not outer space. But Loftus thinks they are deformed by leaning theology and how to say Mass properly. Basil doesn't like outsider priests? Like from countries with more Faith and Vocations than ours? Is he racist? Doesn't Basil live in Scotland now? I bet he didn't grow up there. What was that someone was saying about parachuting in?